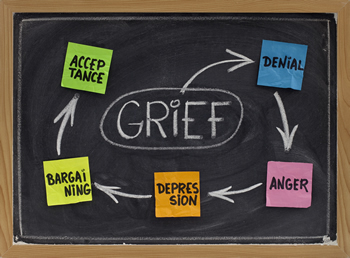 Grief is a natural response to loss; the loss can be very varied and cover a single or a chain of life events. The grief is the emotional response to someone or something being removed from your life. Traditionally loss is associated with the loss of a loved one, but any loss can cause grief. 1: Denial Denial is a conscious or unconscious refusal to accept facts, information, reality, etc., relating to the situation concerned. It’s a defence mechanism and perfectly natural. Some people can become locked in this stage when dealing with a traumatic change that can be ignored. Death of course is not particularly easy to avoid or evade indefinitely. 3: Bargaining Traditionally the bargaining stage for people facing death can involve attempting to bargain with whatever God the person believes in. People facing less serious trauma can bargain or seek to negotiate a compromise. For example “Can we still be friends?..” when facing a break-up. Bargaining rarely provides a sustainable solution, especially if it’s a matter of life or death. 4: Depression Also referred to as preparatory grieving. In a way it’s the dress rehearsal or the practice run for the ‘aftermath’ although this stage means different things depending on whom it involves. It’s a sort of acceptance with emotional attachment. It’s natural to feel sadness and regret, fear, uncertainty, etc. It shows that the person has at least begun to accept the reality. 5: Acceptance Again this stage definitely varies according to the person’s situation, although broadly it is an indication that there is some emotional detachment and objectivity. People dying can enter this stage a long time before the people they leave behind, who must necessarily pass through their own individual stages of dealing with the grief.